London's Gardens: Allotments for the People London's "allotment" gardens are an unusual system of community gardens across the city. Tended by immigrants, retirees, chefs and fans of fresh food, they make up a kitchen community like no other. 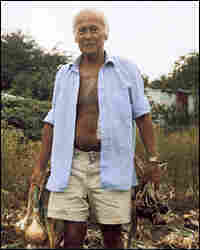 Sam Clark, chef and Manor Garden allotment holder. 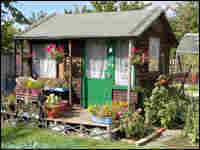 "An Englishman's home is his castle, an allotment owner's home is their shed." — John Kelly. John Kelly, Hassan Ali, Sam Clark and Julie Sumner discuss the cultural hub and private escape that is the allotment shed. 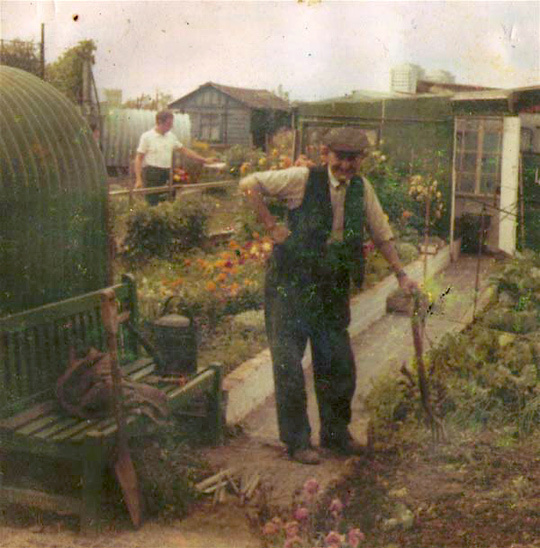 A Manor Garden Allotment plot owner, circa 1970. 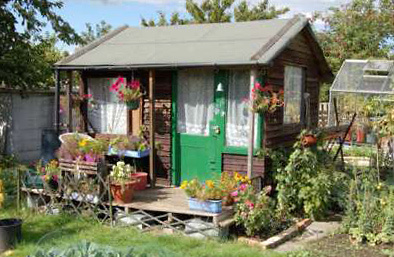 London's allotment gardens are an unusual and vibrant system of community gardens that grow across the city. Tended by immigrants, retirees, chefs and fans of fresh food, the allotments make up a kitchen community like no other. 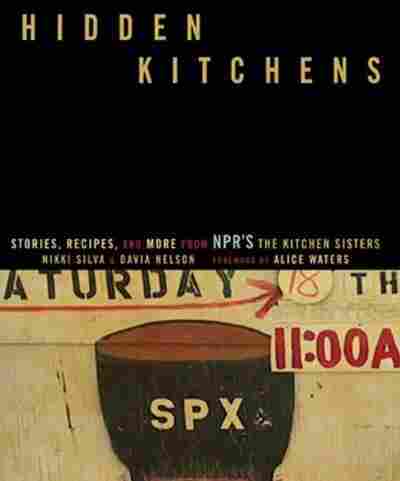 "Allotments" were not a world we knew until we went to Dublin and London to do Kitchen Sister workshops and began to sniff out hidden kitchens in that part of the world. Wedged between buildings, planted in abandoned open spaces and carved into hillsides, these community plots of open space began to be reserved for neighborhood cultivation with the industrialization of England in the 1860s, when rural people poured into the city. 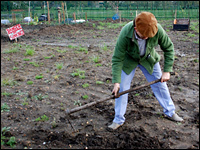 The allotments started to flourish with Britain's "Dig for Victory" movement of World War II, an effort to feed the starving population of London during the war. They are exploding today with the organic gardening and "good food" movements, and efforts to food self-sufficiency sweeping the country. Claire Ptak, whose organic and beautiful cupcakes are sold at the Violet stall at Broadway Market in London Fields, first told us about the allotment movement in London. And we just had to see for ourselves. For about 20 years, retiree Charlie Gregory has been cultivating his plot at Fitzroy Park Allotment in Hampstead Heath, next to hipster artists and an immigrant couple with three Yorkies. There are apple trees, black currant bushes, blueberries, onions and shallots. "Everybody knows everybody," Gregory said. "I'm a bachelor myself. I'm 78 now, and I'm keeping on the go. It's not expensive. For 27 pounds a year, you've got the space of land, you know, and this beautiful spot. You want to keep fit and live to a good old age? Get an allotment!" London chef Oliver Rowe gets almost all his food from farmers and producers working within the radius of the city's train system. In the kitchen of Konstam at the Prince Albert, his restaurant in Kings Cross, Rowe's bread is made of wheat that is grown, milled and baked within 20 miles. The walls of his café are lined with jars of Dartford broad beans, sloe gin berries and sweet squash that he canned last year. "Anywhere where there's a bit of unused green space has the potential to be turned into an allotment," Oliver said. "On the edge of a railroad seating or squeezed in a patch of disused land ... If you go to an allotment in east London, you may have a group of Bangladeshi women who grow all the things they can't buy here, because it's not available or too expensive. "And you'll find old men, puttering around down there, getting away from the wife, sitting in a chaise reading the newspaper, getting some exercise, bringing home some nice food." Jo MacDonald, a woman we met selling vintage clothing, has an allotment of her own. "I think it was the thing that kept me sane when my marriage was breaking up," she said. "I used to just go and wallow about in the allotment." John Kelly, publisher of Prospect magazine, says he once had a plot in north London. He said allotments started in the 19th century and were sparked by philanthropy and health concerns. "So as people fled from agrarian poverty into working in factories, land was given to the city in perpetuity for people to cultivate vegetables," Kelly said. "The allotment boom really happened in 1940s, 1950s." "There were most definitely different communities ... The Italian guy opposite me who was fixated on growing Tuscan grapes for wine. And the Irish were there really just to dig... . There were posh English ladies creating conceptual art, so you'd see these sort of scarecrows in hand-me-down Versace." Talking to people, one place kept coming up: Manor Garden Allotments, a small patch of land in the heart of working-class east London. It is more than 100 years old. But the area has now been lost, at least temporarily. In October 2007, Manor Garden Allotments was bulldozed to make way for a path and landscaping for the 2010 Olympic Games. The 100 or so families growing food there have been moved to another site, but they are hoping to return after the games. "You'd go past rambling old factories, down a little alleyway, behind the bus depot, lots of rubbish everywhere," said Julie Sumner, a Manor allotment holder and organizer. But anyone opening a gate to see the River Lea, she said, would find a different scene. "The slopes of the side of the river [were] covered with plum trees," Sumner said. 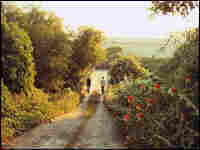 She said the person who set up the Manor Garden Allotments in 1900 was an aristocrat named Major Arthur Villiers, who was a friend of Winston Churchill. "He was so appalled by the treatment of working-class people during the First World War that he devoted his life to providing facilities for the poorest of the poor over in the East End. They built squash courts, swimming pools, cricket grounds." Villiers also saw a need for poor children to eat better food — and for their parents to grow it. Allotments were his answer. "He always said to the people he gave the allotments to 'these are going to be yours in perpetuity when I'm gone,'" Sumner said. Hassan Ali, a Turkish Cypriot who is a retired mechanic, had an allotment at Manor Garden for almost 20 years. "That place, I tell you, is a dream place — like we were living in heaven," Ali said. "I always cook every day something. My friend Reggie, 17 years I know him. Every day we together. 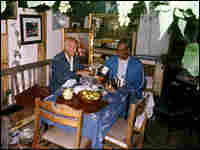 And he brings something from his garden, and I bring something, and we cook and eat there, me and Reg." The loss of the Manor Garden Allotments to the Olympics construction came despite protests and calls for preserving the area. 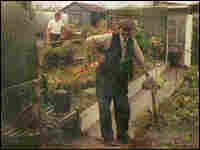 But the allotment movement is flourishing all around London, aided by the Good Food movement, the British devotion to gardening, soaring prices of food and fuel, and a desire to create and maintain a meaningful community. 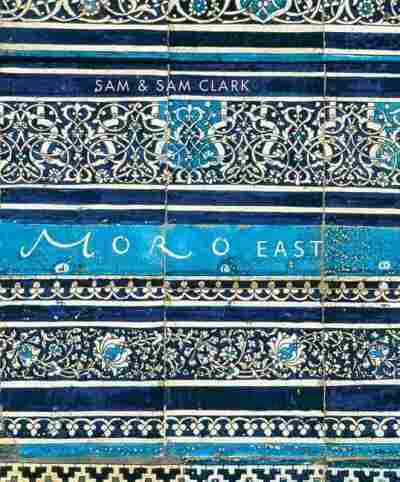 Samantha and Sam Clark, longtime Manor Garden allotment holders and owners of Moro, a four-star Mediterranean restaurant in London, chronicled the stories and recipes of their allotment neighbors in their Moro East cookbook. In it, they describe an unusual garden community, forged across many religious and cultural divides. Daily rituals of tea — and traditional grilling of meats in garden sheds and outdoor kitchens — bring families together in ways that defy the divided times in which we live. In a large saucepan, melt the butter in 2 tablespoons of the oil over a medium-high heat. Soften the onions with a pinch of salt for 15-20 minutes, stirring occasionally, until golden. Turn down the heat to a medium-low and stir in the potatoes, garlic, bay leaves and another pinch of salt. Put a lid on and cook gently, stirring often so the potatoes do not stick, for 25 minutes or until the potatoes are tender. Add the stock and nutmeg, bring to the boil and simmer for 5-10 minutes. Remove the bay leaves, double-check the potatoes are cooked and remove from the heat. Whiz with a handheld blender (or in a food processor) until very smooth. Up to this point, all stages can be done ahead of time. When you are ready to serve, reheat the soup if necessary, and stir in your greens. Bring back to the boil and immediately remove from the heat. Meanwhile, fry the chorizo in the remaining oil in a small pan until well-colored, cooked through, and crisp in parts. Check the soup for seasoning and serve with the chorizo and its delicious red oil spooned on top. The point of this dish is to gather whatever you have ready in the garden to make a delicious salad; it uses so many ingredients that it can be a great way for a number of allotment neighbors to pool their resources. Put everything in a large salad bowl. Pour over the oil and lemon juice or vinegar and season with salt and pepper. The salad may have a purple/red hue from the beetroot. Often when you dig up two or three potato plants, there is an annoying amount of undersize potatoes knocking around. Hassan recommends this way of cooking potatoes as a particularly good way of using up these little guys. Crack each potato slightly with a heavy object such as a metal cup, rolling pin or mallet. Toss with salt and let them stand for 5 minutes. Choose a large saucepan, wide enough to accommodate the potatoes in a single layer (i.e. about 12 inches), and place over a medium heat. Add the olive oil and, when it is just hot, the coriander seeds and potatoes. Stir well, cover with a tight-fitting lid and turn the heat to low. Cook for approximately 20-30 minutes, giving the pan a good shake every 5 minutes, until the potatoes are tender and partly browned (raise the heat towards the end of cooking, if necessary). Pour over the red wine and add a little black pepper, shake well again, then boil, uncovered, for a couple of minutes to get rid of the alcohol. Switch off the heat and let the potatoes sit for 5 minutes. Produced by The Kitchen Sisters (Davia Nelson and Nikki Silva), with Roman Mars and in collaboration with Laura Folger and Nathan Dalton, and interns Eloise Melzer, Julia Plevin and Alessandra Wolner. Mixed by Jim McKee.